The Library Yamaha headphones have been expressly designed to function with the piano and inhibit sound transference into the library. 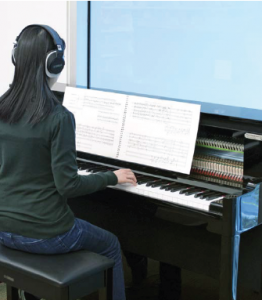 To maintain appropriate sound conditions in our research environments, the pianos must be used with these headphones and the headphones must be worn at all times. Please keep drinks and food away from the piano. Headphones are available at the Circulation Desk for 2 hour loan (no renewals). Make sure the piano is plugged in. Plug the headphones into the headphones jack - located under the keyboard on the left hand side of the piano. Turn the power switch on - located to right of the keyboard. Adjust the volume - located beside the headphones jack. Turn the piano off when done and return the headphones to the Circulation Desk.